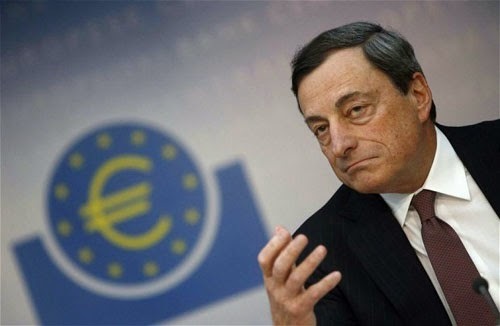 The European Central Bank (ECB) holds its monthly meeting in Frankfurt today – the day after ECB President Mario Draghi’s 67th birthday. As usual, Open Europe’s Head of Economic Research Raoul Ruparel has published a preview on his Forbes blog, explaining what we may expect from today’s meeting. Following ECB President Mario Draghi’s dovish speech at Jackson Hole last month this week’s ECB meeting has taken on new importance. This has been further enhanced by the recent Eurozone inflation data which put annual CPI at 0.3% in August. The headline figure hides some of the story with core inflation actually rising to 0.9% (from 0.8%) but the ECB’s previous inflation forecasts have begun to look increasingly out of line with reality. However, those expecting a big move are likely to be a bit disappointed. As I pointed out last month, it is almost nonsensical for Draghi to unveil new measures before his previous policies have been implemented. I am thinking specifically of the TLTROs (targeted long term lending operations) the first of which will only be conducted on 18 September. Any big announcement now could undermine the predicted take up of these measures – which clearly remain the ECB’s preferred approach for injecting further liquidity. A further interest rate cut: Many will validly ask, what is the point in a further cut now? Of course it would have little to no economic impact, however, it would once again signal the dovish bias of the ECB. It would also signal a clear shift in the ECB’s position given that Draghi has previously said rates are unlikely to get any lower than current levels. It becomes another mechanism to express his commitment to further easing. There also remains scope to make the negative deposit rate more negative, although there is a cap on this since, at some point, it will be cheaper for banks to simply hold cash than deposits with the ECB. Purchases of private sector assets – specifically Asset Backed Securities (ABS): The ECB has long telegraphed such action and it is the next obvious tool at its disposal. Whether or not it will be announced this month or in the coming months is a bit of a toss-up. It seems the ECB is not quite ready to implement it yet and has made a big song and dance about the need to adjust regulations and definitions of ABS, which are yet to fully take place. Whenever it is announced, implementation is likely to be later this year to allow the negative deposit rate and TLTROs to have time to work. I remain sceptical on the effectiveness of this policy, which I have analysed in detail on the Open Europe blog. Ultimately, the market for the transparent ABS related to SME loans remains very small in Europe and focused in the core countries rather than the periphery (where this money really needs to flow to). For example, in Q1 2014, of the €18.5bn in ABS issued, only €1.6bn used SME loans as collateral. The ECB maintains that it can and will help create the market in this area, yet with this measure having been forecast for some time, you would expect there to have been some market response already. As with many of Draghi’s press conferences, all of this will be weaved into a dovish speech including a few key trigger words for markets – few other central bankers are as adept in their communication. As for full blow Quantitative Easing on sovereign debt, this remains someway off in my mind and hurdles remain high. Its use will ultimately be tied into developments in the fiscal and political sphere, as hinted at in Draghi’s speech (more detail on this coming in a future post). The ECB will be loath to unveil QE, which it fears can only buy time, without further commitment to reforms, a clearer fiscal approach and developments on the structure of the Eurozone which such changes will entail.